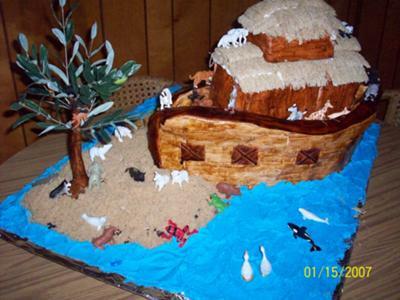 This Noah's Ark cake was made with heart pans. Bake four layers and put the two top parts of the hearts together and use the points as the ends of the Ark. Then trim off some of the point and lay on top for the railing. Just simply make two square cakes and stack on the top for the upper two decks and use shredded wheat for the thatched roof. This was for my Daughters Baby Shower. It could be used for a birthday cake or a Church Gathering. Amazing cake! How did you make the wooden look for the sides and windows? I was at the baby shower and saw this cake in person. Picture does not do justice. Beautiful! Sherri, you are one talented momma!!!!! !